These are the swaps I created for today's Team meeting and summer BBQ, using the new Carols of Christmas bundle. This ***NEW*** bundle of stamps and Dies was released early to Independent Stampin' Up! Demonstrators and will be released to customers on 1st August. I'm having lots of fun creating with this gorgeous set. Pop back and see some other samples soon. 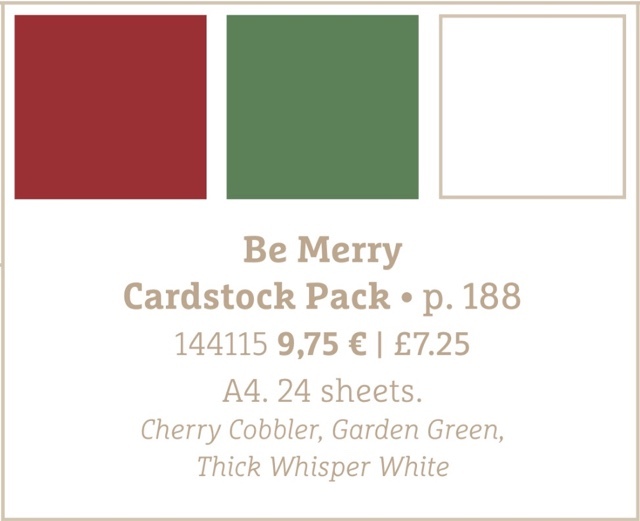 Today I'm sharing with you some projects I've been working on this week, featuring the festive Designer Series Paper 'Be Merry', in our Annual Catalogue. It's never too early to start work on the festive season, especially with a 'Christmas in July' themed team meeting next weekend ! 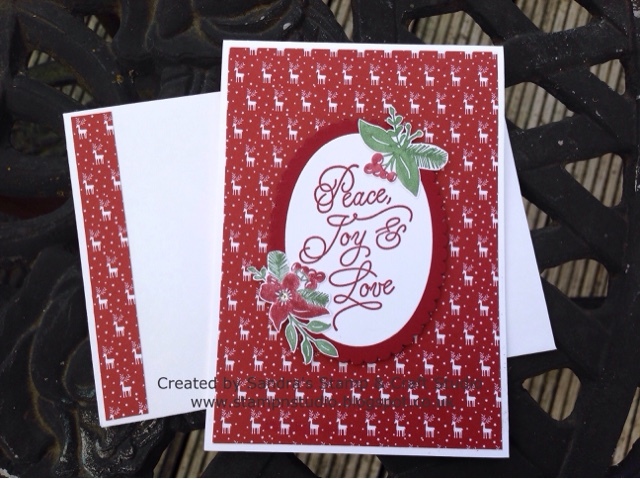 Here, I chose to work with the Peace This Christmas stamp set #141567 (W) #141570 (C). Firstly, I started with three Christmas cards. It was hard getting good light with the glary sunshine causing shadows, so today's photos were taken on our decking under the parasol. For the first card, sentiment was heat embossed with Gold Stampin' Emboss Powder #109129. The lines were drawn using Cherry Cobbler marker and floral features in Cherry Cobbler and Garden Green, were stamped using marker to stamp and fussy cut by hand. Once attached to corners of sentiment, the vellum was attached to base card using a tiny dot of Tombow in the corners and mini glue dots under the embellishments. My second card started with the centre being cut from Delicate White Doilies #141701. More embellishments were stamped and fussy cut as above and attached in the form of a wreath, with sentiment added using Labeller Alphabet #141936. The last card uses the Stitched Shape Framelits #145372 with Layering Ovals Framelits #141706 for this topper, together with more floral embellishments as before. 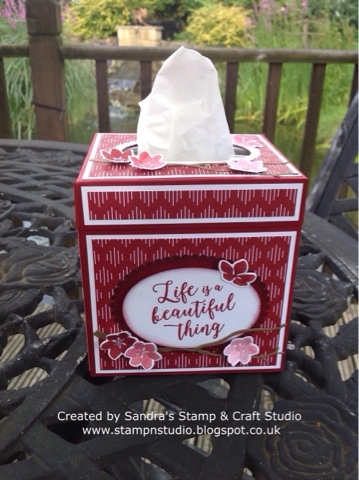 The first of my 3D projects is an updated version of a frequently made covered tissue box, this time using the 'Be Merry' Designer Series Paper in conjunction with sentiment, branch and flowers from another of my favourite bundles, Colourful Seasons #145348. For my next planned project, I have been 'stalking' arrival of my friendly Mr UPS driver today, bringing me a fabulous new bundle 'Carols of Christmas' being released on 1st August. As an Independent Stampin' Up! Demonstrator, I was able to order this a month early, to prepare projects and classes. I have incorporated some lovely new Pattern Party Decorative Masks #144103, Embossing Paste #141979 and Palette Knives #142808, enabling me to feature Mixed Media style projects. For my last Christmas project, I had to steer away from my original plan using 'Be Merry' Designer Series Papers for my Scrapbook page. Unfortunately, despite purchasing specific laser friendly photographic paper, the printing quality hasn't improved. This page was created using a photo from our mini Christmas cruise last December. I loved creating the sea using the High Tide stamp set #143006, stamped in first, second and third generation ! 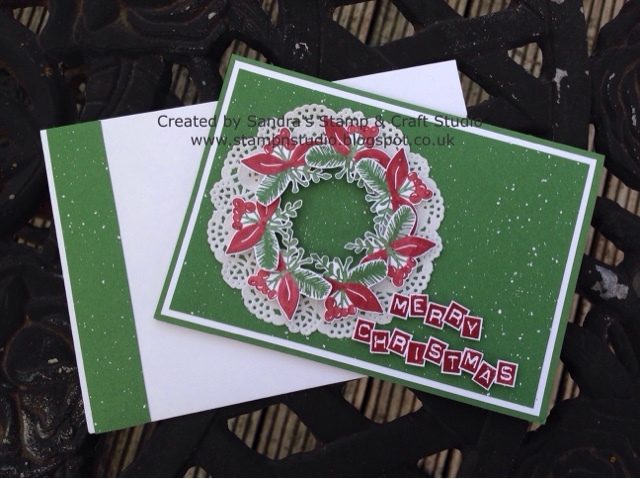 I hope you have enjoyed viewing this weeks Christmas collection, which I have thoroughly enjoyed creating. 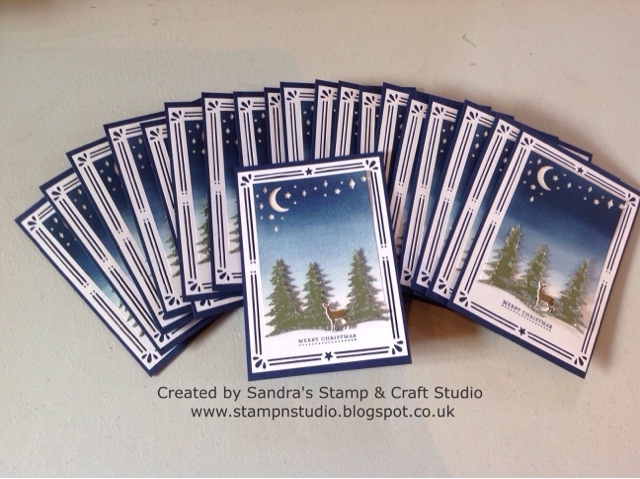 Why not book on one of my festive classes and create some of these yourselves ? 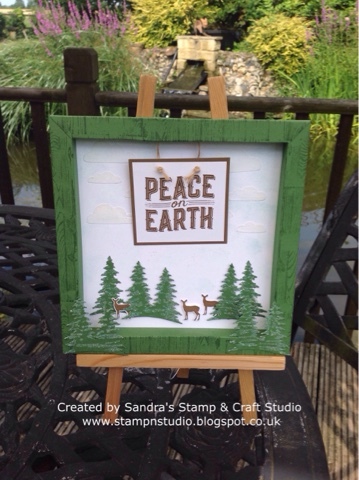 Bye for now, but pop back soon and see some more creativity using the ***NEW*** Carols of Christmas bundle. This evening, I've been putting some finishing touches to a selection of projects featuring the 'Be Merry' Designer Series Paper. 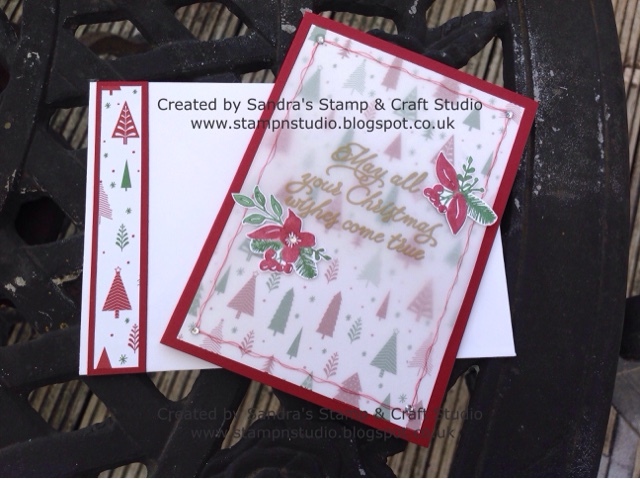 The co-ordination that Stampin' Up! give us, is the reason why I signed up as an Independent Stampin' Up! All of the Designer Series Papers have a card pack in co-ordiating colours. This week has been my first session of Christmas planning with the 'Be Merry' festive suite. Pop back tomorrow and take a look at how some of my finished projects turned out. With our village 2-week Teddy Bear Festival in full swing, today I created and delivered a commission I received at our garage/yard sale 'kick-off' event on Saturday. 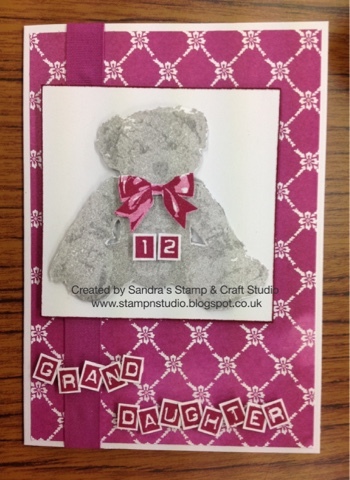 My customer saw the Baby Bear stamp set on table with my 'Craf'TED' Teddy Bear and requested a card using that set for her grand-daughter, who would be celebrating her 12th birthday shortly. The bear is stamped twice here and layered up onto Berry Burst Designer Series Paper. I'm loving the Labeller Alphabet stamp set, stamping in Berry Burst, with each one snipped out and mounted using the ***NEW*** 'Mini' Stampin' Dimensional 3D foam pads. These are excellent value with 720 in each pack compared with 300 standard size, saving time cutting the others in half for smaller pieces, like these letters ! Another firm favourite of mine in the new Stampin' Up! Annual Catalogue. Catching up with Maggie at a neighbouring village fortnightly craft club, she was delighted with her card and donated £5 to my Macmillan bucket. 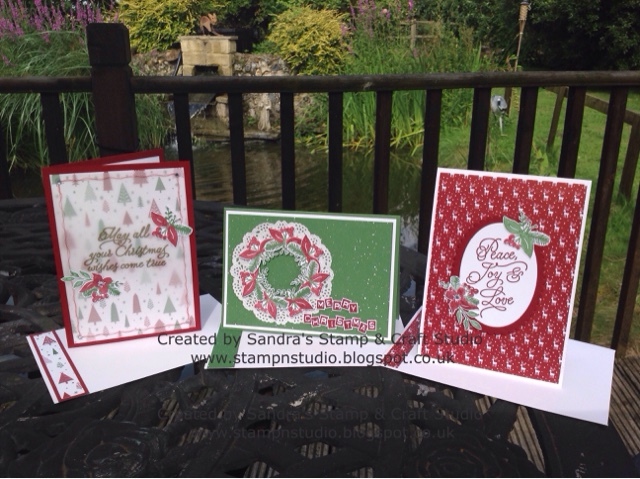 Having met this group only 2-weeks ago, they had enjoyed seeing my stamping with the Delightful Daisy bundle. Watching me create another coordinated project today, several of them have now booked a date to join me at my Studio, to create Christmas cards. Feeling quite chuffed today ...... I've actually made a dozen cards for husband and I to send this Christmas. This was one of my card club creations from last month. I keep spare pieces for each design in cellos and had several pieces of DSP ready cut to size, few pieces of Real Red card layers and trunks and stars prepared in mini jam jars. So, when emptying the caddies to refill with July's cards, I just had to have a little creative session myself. Oh, didn't that feel really good !!! I hope you like my design. These will now be put away for writing & addressing in the Autumn. Who knows, one of them could be winging itself to one of you ! How would you like this stamp set for FREE ? 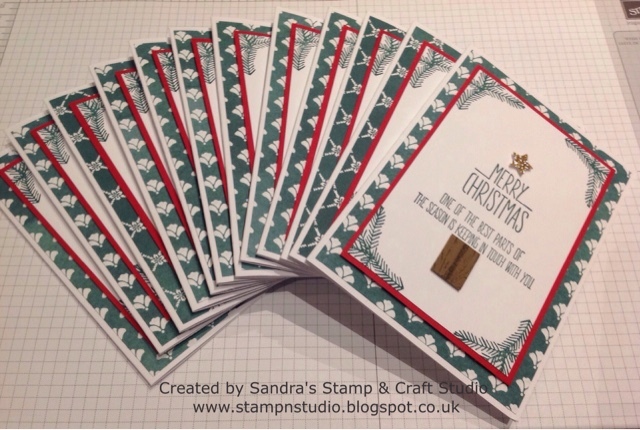 My bundle, with the co-ordinating dies, is already on it's way and I would love yours to be too, with fabulous offers in July from Stampin' Up! Give me a call to find out more and maybe schedule a catch up over cuppa. Watch out for samples popping up as soon as Mr UPS arrives with my order. Today saw the start of our village two-week Teddy Festival, with over 60 bears of varying shapes and sizes, popping up all over the village. Having moved here just over 2-years ago, this is now our 3rd Festival and again joined in the spirit of the event. We were pleased to have been 'donaTED' a life size bear made from chicken wire and straw, by the previous property owners. I'm always amazed at the amount of thought and creativity goes into the Bears and am looking forward to seeing this years entries round the village over the next few days. 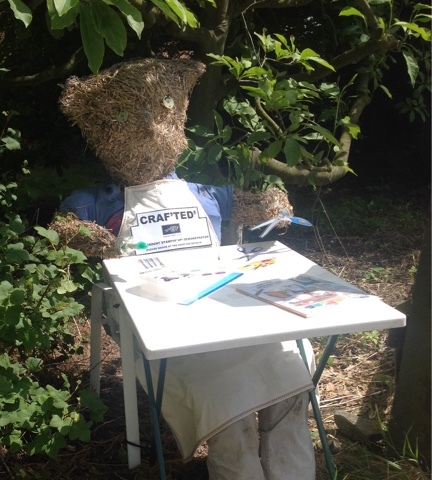 Craf'TED' featured our bear wearing an apron, sitting at a craft table and surrounded by craft materials, with an empty Tombow adhesive in one hand and laminated pair of scissors in the other. My Stampin' Up! Baby Bear stamp set was photocopied for display, laminated and attached to a take-away box, before being taped to the table. 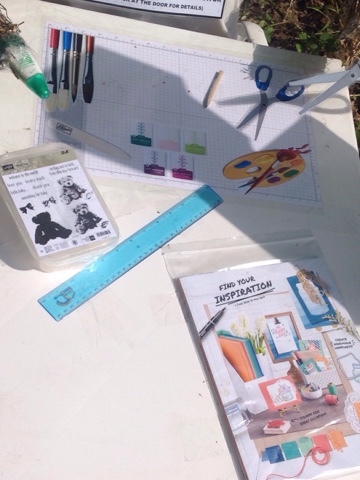 The grid sheet had pictures of various craft items printed, cut out, attached to Grid sheet, laminated and taped to the table with pencil, ruler and old catalogue in ziplock bag. My newsletters will also be placed out each day with a 'please take one' notice and taken in overnight. At today's garage/yard sales, I had a friend from a neighbouring hamlet sharing my front garden space, selling her wares and helping direct people indoors. In my Studio, we were selling handmade cards and craft materials, all donated by myself and customers for sale in aid of Macmillan Cancer. I met some lovely people and some great networking opportunities with visitors, to follow up on.